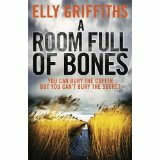 I’m currently reading a very enjoyable series, Ellie Griffiths’ Ruth Galloway books. I read the first, The Crossing Places, a few years ago and it didn’t really take, but after the series was recommended by my friend Moira over at http://Clothesinbooks,com, I tried again with A Room Full of Bones and this time it did. I am now reading The Janus Stone and I’ve downloaded another one for when that’s finished. It’s a pleasure to come across a new series and know that there is a lot more good reading ahead. At the same time I am working on the second in a series myself, and it’s got me thinking about what makes a successful series. The attraction for the reader is that cosy sense of catching up with people who have become friends. You know roughly what to expect. It’ll be the same but different. And that’s a very comforting feeling at the end of a long day when you’re settling down to read in bed. It can be very enjoyable for the writer too. You know your characters inside out and have got fond of them. Over a long series characters have time to develop. Indeed they must develop, because one of the dangers of a series is that it can get repetitious and run out of steam. The detective’s troubled love-life can get tedious and you risk the reader thinking ‘why doesn’t the guy just get a grip?’ Sometimes the writer gets fed-up before the readers, as Conan Doyle did with Sherlock Holmes, and Agatha Christie with Hercule Poirot. Is there a case for limiting the number in a series as Swedish crime novelists, Maj Sjöwall and Per Wahlöö did – and Henning Mankell after them? In both cases the writers decided that there were only ever going to be ten. Nicholas Freeling may have gone too far in bumping off his detective Van Der Valk half-way through a novel, shocking and dismaying many readers (Trollope did something similar in The Last Chronicle of Barset). Another approach is to keep things fresh by starting another series to run parallel with the first, as Ellie Griffiths has done with The Zig-Zag Girl. Or simply to switch to a second series, as Martin Edwards has done so successfully with his Lake District mysteries. I’m not going to name those writers who stayed too long at the party (it must be a temptation) and we’ll probably have different views about who they are. But I will list just a very few of my favourite series. They include Sjöwall and Wahlöö’s Martin Beck novels (10), Magdalene Nabb’s Marshall Guarnaccia books set in Florence (14), Martin Cruz Smith’s Renko novels (8). And then there’s Maigret. Simenon breaks all the rules. There are dozens of Maigret novels, but I can never feel there are too many. It’s a long time since my last blog and I’m sorry for my unexplained absence. There’ve been a number of reasons. My lovely mother-in-law died in April. She was 97 and had had a wonderfully interesting and fulfilling life. She was a GP, qualifying before the war when few women went into medicine. She is sorely missed. And then I’ve been busy finishing a draft of a novel at the same time as I was getting ready to hand over my work as membership secretary of the CWA to my successor, Linda Stratmann at the end of May. That will, I hope, free up more time to blog – I aim to get back to once a week – but for a while there was a lot to do, packing up files, bringing Linda up to speed and generally trying to leave everything in good order. So, what have I been reading in the meantime? I’ll take me a while to catch up, but one thing I’ve been doing is reading and in some cases re-reading with much pleasure the crime novels of Magdalen Nabb, set in Florence and featuring the highly sympathetic Marshall Guarnaccia. I read the early ones in the 1980s and then rather lost touch. She wasn’t a very prolific writer. There are fourteen spanning 27 years and I think they are in some respects a little uneven in terms of plotting, though the skill with which she conjures up the atmosphere of Florence remains constant. She’s an elegant and classy writer. The best ones for me are the first one, DEATH OF AN ENGLISHMAN, THE MARSHALL AND THE MAD WOMAN, THE INNOCENT, SOME BITTER TASTE, and THE MARSHALL’S OWN CASE. The only one that I didn’t really like was THE MONSTER OF FLORENCE, based on a notorious series of real-life murders. Sadly there won’t be any more as she died in 2007. Soho Press have been reprinting them in attractive paperbacks and I do recommend them.